The Dow Index posted a steep loss of 0.72%, weighed down by further declines in Boeing’s stock and news reminder that the US has trade conflicts on various fronts. Just as hopes for a US-China trade deal eked gains out of US equities last week, a fresh trade war emerges and deteriorates global sentiment as President Trump threatened to impose tariffs on the EU through a tweet in efforts to counter the US’s ledger of trade imbalances. In terms of data, US job openings fell below estimate in February, contrary to the payrolls report that showed an increase in employment in March. On today’s data front the US publishes CPI reports and is expected to show inflation remains subdued in the US. Moreover, markets will look to FOMC minutes ahead of the start of earnings season on Friday for indications on the depth of slowing growth in the US as the rate policy remains out of question given the Fed’s dovish stance. The Dow Index extended losses on Tuesday as the price broke through the support at 25260 to reach 26080 before ending at 26150. 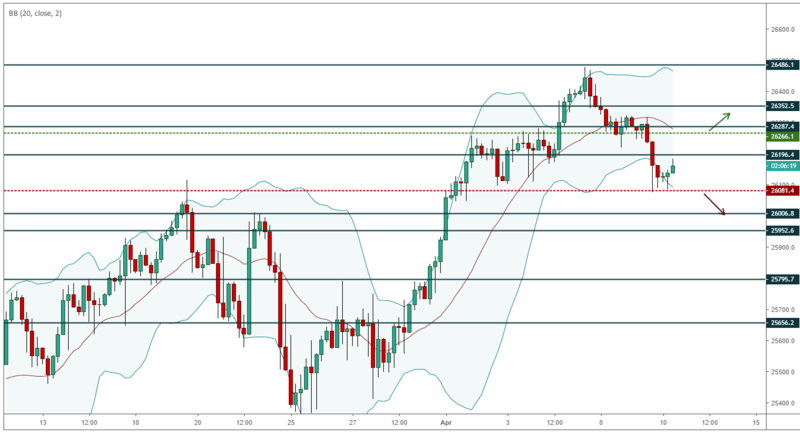 A deeper retracement remains likely should support at 26080 fail, from which price would target the psychological level at 26000 and support at 25950. The 25260 level is now acting as resistance and holding below this level should maintain the short-term bearish bias.